It’s fair to say that the DCEU slate of films stumbled out of the gate. Man of Steel received mixed reviews with the needle slightly towards positive. Three years later, Batman v Superman seemingly pissed off everyone on the planet, and Suicide Squad was a bittersweet victory for Warner Bros.
Much like how The Force Awakens had the unenviable task of bringing that “Star Wars Feel” back to the franchise, director Patty Jenkins had her own uphill battles to climb with the latest blockbuster superhero film. It had to be great, not good, while not only reinvigorating a shared universe, but it needed to be progressive in a manner fitting contemporary society. And it all had to be done with a female lead. Wonder Woman is a true wonder of a film in every sense of the word. It goes beyond the scope of simply being a great movie while effortlessly showcasing a hero that everyone can be proud of, regardless of race, gender or ethnicity. None of the intangibles that empower Diana Prince overtly stand out to the point of fulfilling troupes of the “Mary Sue” variety. Instead, there is a dynamism weaved within the fabric of the narrative that pronounces the aura of Wonder Woman not because she is a female hero, but because she is a hero. 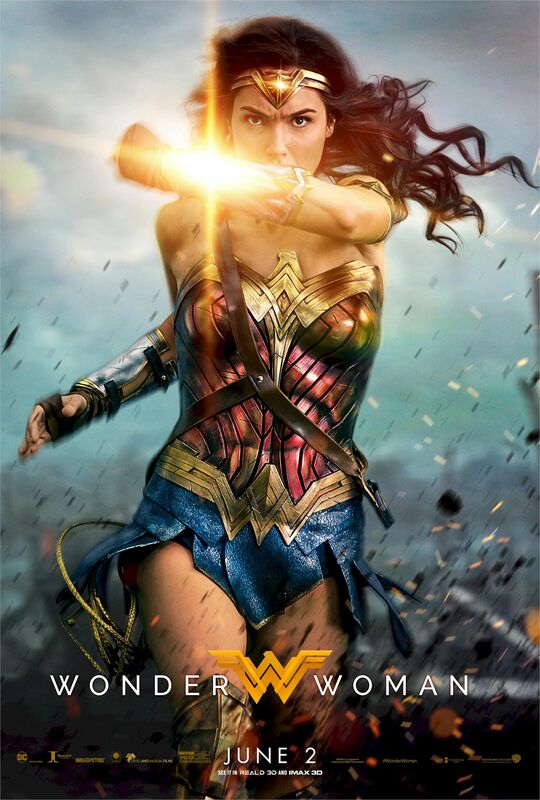 Wonder Woman’s maiden voyage to the big screen was damned with faint praise from the moment an Israeli model and actress named Gal Gadot was cast in the iconic lead role. There are lots of superbly talented women in Hollywood and yet, Warner Bros went with an unknown novice. I’m happy to report that Gal Gadot is absolutely sensational in the role. She makes the viewer feel every sentiment that she emotes on screen. The fish out of water aspect of her character is beaming with optimism and compassion. Diana’s first encounter with ice cream immediately dazzles her taste buds and she praises the vendor stating “It’s wonderful. You should be very proud.” This was pulled right from the comic book (Justice League #3 – New 52), which was fun to see and it got a nice laugh. Lilly Aspell was brilliantly cast as 8-year-old Diana and performed just as well. Her inquisitive and slightly rambunctious nature made the audience smile at every turn. It showed that she wanted to do good in the world from the very beginning, which augments the character in her later years. The sadder side of Diana’s journey sets up a pivotal moment that I was waiting for in order to get a real range of Gadot’s acting. Like in most tales that involve a highly optimistic hero, the realization that this can be a cruel, cruel world brings out all of that pain and heartache to the point where you feel bad for her, even though you knew it was coming. Gadot nailed it! She conveyed it to the brink of being broken and I just wanted Steve Trevor to give her a hug. Speaking of USAF Pilot Steve Trevor, it was intriguing to see how Wonder Woman’s longtime confidant and romantic interest would be handled. The films World War I setting makes it difficult for him to appear in future movies in a contemporary setting. Chris Pine handled the role extremely well and I wanted more of him. He was everything he needed to be at the appropriate times. This was all anchored by his stanch sense of duty in ending the war. With Pine’s performance, we’re also reminded that war is ugly. People die and lives are irrevocably changed. While the narrative didn’t hit the audience over the head with that notion, it’s wasn’t glossed over either, which was a nice change of pace from other comic book films that tend to take collateral damage lightly. There are two nitpicks I have with the movie. The CGI stuck out like a sore thumb, failing to blend in with the film’s aesthetic, exhibiting little realism. Some people felt Wonder Woman’s lasso fell into this category, however, I give it a pass. After all, it’s essentially a piece of rope. It needed to standout a little more. The second thing that didn’t work was the casting of David Thewlis as the lead antagonist, Ares. Thewlis looked and acted like too much of a sophisticated British gentleman for me to believe that he was the god of war. Wonder Woman is the breath of fresh air that the DC Cinematic Universe needed. The direction of Patty Jenkins brings about a great story highlighting a beacon of hope in dark times with some great performances. I hope that Jenkins will get a seat at the table when it comes to creating DCEU going forward. Just like Iron Man and Captain America at Marvel, Wonder Woman needs to be the centerpiece of the DCEU. Not only am I more excited for Justice League, I’m also more excited to see her in Justice League when it hits theaters in November. Speaking of the theater, the early preview showings I go to are usually not that well attended. This time, however, it was the complete opposite. There was a certain electricity in the air as more and more patrons found their seats. It began to feel like an event, which is something I haven’t felt since the first Avengers film. I adored the movie and want to see it again. I have to disagree about David T.’s performance. Ares had to be in hiding so he could pull off his plan. However, I do think they could have done a better job with his transformation once his true identity was revealed. That being said I loved Danny Huston’s character. Gal Gadot nailed Wonder Womans’s character. I want sure I was going to see Justice League but now I’ll see it just for her.